A set of 6 different shaped boiled egg mold. Add more fun to your breakfast with Star, Fish, Car, Heart, Rabbit, and Bear shaped egg molds. Easy to use just peel off the outer eggshell of a hard-boiled egg and place it inside these egg molds. Turn your ordinary egg into a cool and creative shape. Irrespective of whether you love or hate the mighty Darth Vader, this unique range of Star War themed Wine stopper is a must have for any Star Wars Fan. This range of cool wine bottle stoppers come in various Star Wars shaped characters which makes it trendy and exciting at the same time. What can be better than having breakfast with a smiley face on your plate? This cute looking Smiley Face Egg Mold can be used to give smiley face shape to your fried eggs, pancakes and much more. You may need two eggs to make a perfectly shaped smiley face. A helpful tool to add more fun to your party snacks. A beer mug with a bottle opener a perfect gift for a true beer lover. 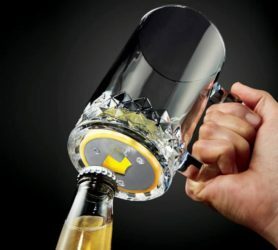 This Beer Mug With Bottle Opener features a traditional diamond cut pattern at its base and a solid stainless steel bottle opener at the bottom of the glass with a magnet so that bottle caps won’t fly away when you pop up a cold one. Dinosaur! Dinosaur! in my lunchbox! Amaze your kid by adding this adorable dinosaur sandwich in his lunchbox. This innovative dinosaur sandwich cutter will get the work done in seconds and there won’t be messy shape at all. This cool little cutter will also rock your house party with its cool shapes. Now you can crack open cold ones with this Batman Multi Tool. One of my favorite bottle opener and character inspired by DC comics. This Batman multi-tool is no ordinary keychain that you see around every day. A cool 4 in 1 Batman multi-tool. A bottle opener, keychain, crosshead screwdriver, and flathead screwdriver. A perfect gift for Batman fans and collectors. This funny side up owl shaped egg mold works same as the robot fried egg mold listed above. All you need to do is place this silicone owl egg mold in your frying pan, break two eggs inside the rings and a cute looking owl is ready to serve in your plate. Kids will love to have it every day. Easy to make your slices precise every time with this Cheese degrees cutting board. Durable bamboo cutting board with engraved measurements, and not printed. It would make a perfect gift for those who like to do detailed and cutting with accuracy. Cut your veggies and cheeses with such precision never seen before. An elephant sink cutlery drainer which can be used in both kitchens and bathrooms. It can be your ideal cutlery drainer to hold your dry utensils or your toothbrush holder. Made up of plastic material that comes in a cute elephant shape with a tusk which works as cutlery drainer.